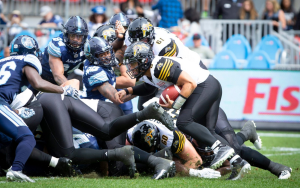 Fresh off the bye week, the Argos (with the returning Ricky Ray) are looking to turn around the club’s 1-4 BMO record against the visiting Lions. We’ve got everything you need to know in about 8 minutes. Argos vs Lions. Game On. The Argos continue their western road swing with a visit to the 2-0 BC Lions. With the Leos dominating on both sides of the ball, the Argos will have their work cut out for ’em. Are they up to the task? Jube has some thoughts. The Argos continue their 2015 season-opening road trip with a stop on the Pacific coast to take on the Lions. Coming off the bye week, the Argos are looking to bounce back from their Week 3 loss. Here’s what you need to know heading into kickoff.